Bhuna Kukda is a spicy chicken cuisine from Rajasthan. It is dry chicken preparation coated with red masala. 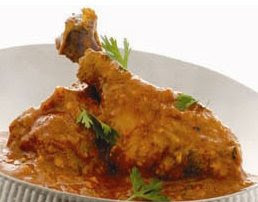 The word "Bhuna" means dry roasted and "Kukda" means chicken, hence the name of this cuisine is Bhuna Kukda. This cuisine is prepared by blending many spices and is usually served with rice or rotis. Clean and wash the chicken, cut into big size pieces. Take off garlic. Remove the skin and keep them aside . Soak red chillies in lukewarm water for 1/2 an hour. Grind everything garlic, red chillies, cloves, green cardamoms, cinnamon and turmeric powder to a fine paste. Apply the prepared masala and salt to the chicken and keep it to marinate for 2 hours. Heat up oil in a kadhai, mix in cumin seeds, when they crackle mix in the marinated chicken and stir fry on high flame heat. When all the moisture has evaporated, mix in beaten yogurt, mix in a little water and continue cooking on high flame heat. Stir fry till all moisture has evaporated and chicken has cooked. Adjust salt and stir fry till the masala coats the chicken. Serve hot, sprinkled with coriander leaves. Note:For better taste, marinate the chicken and keep it in refrigerator for 2 hours instead.